— but me, I think it’s the best. ….. you thought I was just one big cynic . —- and that’s somethin’ the world could always use a lot more of. …… and I never even end up getting goodies outta the deal. …….. that might be an overstatement, there. Goodies of a sort . Now, buying presents to show somebody how you feel about them are all well and good, I guess…..
—- so they don’t really have to enunciate how they really feel. —- instead of going to their friendly neighborhood Mercedes-Benz dealer and letting a couple 300SL’s do the talking for him. Not that a vintage 300SL wouldn’t get MY heart aflutterin’….. So, maybe I’m wrong after all. 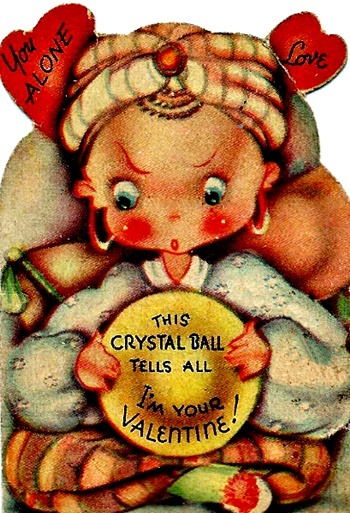 You really do need something to say what you wanna say without comin’ out and sayin’ it…..
You can’t go wrong with a Valentines Day card. 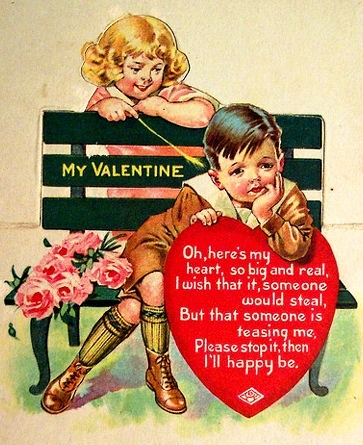 Whether it’s an antique sentimental one, like this one…. and compulsively obsessed moment …..
despite the potential and varying vacissitudes of living Le Vida Loca. would somebody please tell me just what the hell I was talking about? Oh yes… V – D .
I especially like the older cards…. that makes even a big ole dumb muscle head like me a little wistful. Hey — love is important, ya know. But I don’t see the point if you never express it. I know it ain’t easy to say all that mushy stuff…. And it’s just so much less stressful to get her something like candy or flowers, or that expensive, finely crafted piece of automotive flesh. Pick her out a card, man. ….if you’re still working out that shyness issue you’ve been dealing with since the third grade. 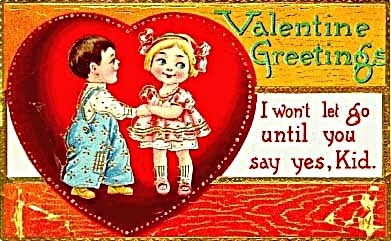 you’ll get her a card . If you put it in a envelope with the keys of that vintage 300 SL and place it on the windshield with some flowers and Belgian chockies, well, then, I can absolutely guarantee success. 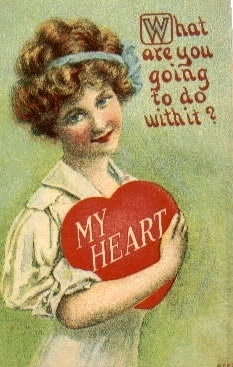 Maybe some vintage Absinthe would go with it, too. You don’t want her thinking you’re cheap, after all. And, hey– it’d work on me, anyway ! 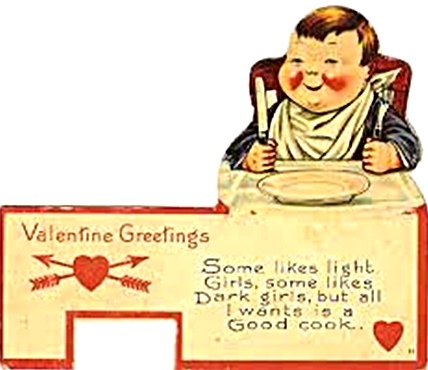 oh, and Happy V D .
There are some really funny and interesting cards here…. Be sure to tell her the Muscleheaded Blog sent ya. 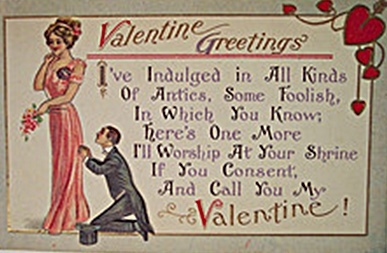 This entry was posted in Art, Collectibles, Entertainment, Holidays and Events, humor, Love, Love and Relationships, Postcards, Poster Art, Society, Uncategorized, Vintage and tagged antique, classic, February 14, funny, humor, love, sarcasm, valentine, Valentines, Valentines Day, vintage. 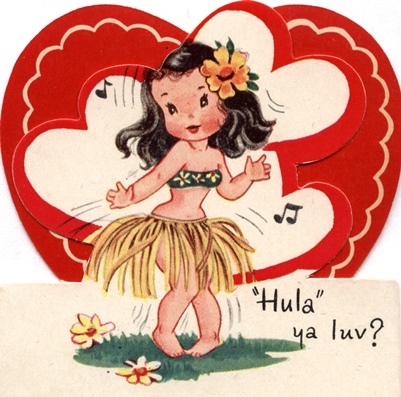 That hula girl is ADORABLE! SO cute!!! And the second looks a bit like Jean Harlow. Thankfully, no odor. But thirteen year olds seem to provide that on their own — no card necessary. o.O Yeesh! I’m more worried about those big ol’ feet! 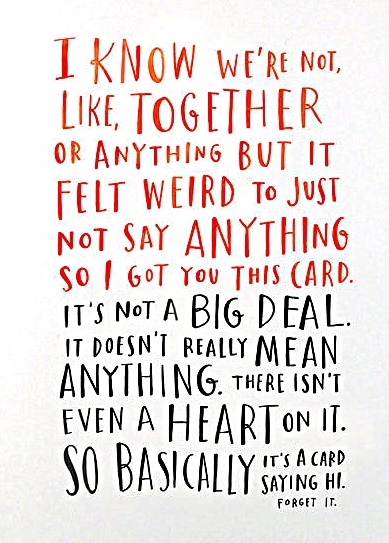 Wonderful thoughts on spreading the love — be it with cards or whatever. And cards can really help us when we have a hard time finding the words. 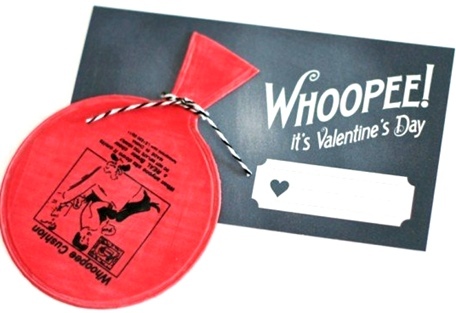 Or if we want one with a whoopie cushion. Man, seeing a photo of that card on your blog was a new one for me! Thank you very much for the reblog !!!! you’re welcome , thanks for your articles ,sorry for not commenting or reblogging more lately , been quite busy lately .